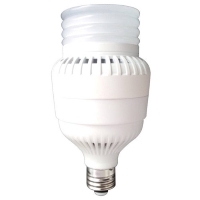 This non-dimmable A23 LED bulb from PacLights is energy efficient, consuming only 40 watts of power, yet delivers light that is the equivalent of a 200 watt incandescent. This LED has a light output of 3200 lumens and color temperature of 6000K for a daylight white glow. This bulb is instant-on to full brightness, and has a long average lifetime rating of 30,000 hours. It has an active cooling system and high lumen maintenance to deliver brilliant illumination wherever applied.